Welcome to the Clarity Library of Free Resources!! 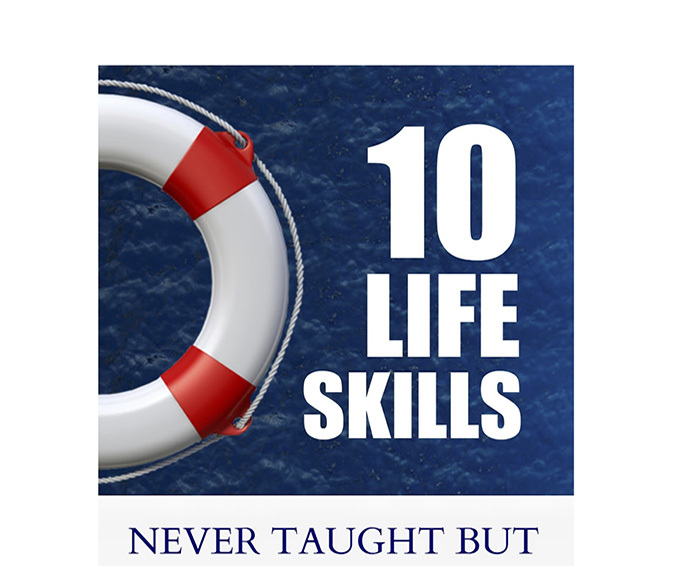 On these pages, you will find articles, worksheet, e-books, audio interviews, and maybe even a video or two in the near future. All of these resources are focused on helping create a life and business you love, by helping you create the life you crave. Have fun and feel free to take your time exploring the shelves of materials that are currently available, download whatever catches your fancy, and enjoy!! Hope to see you back here again!! 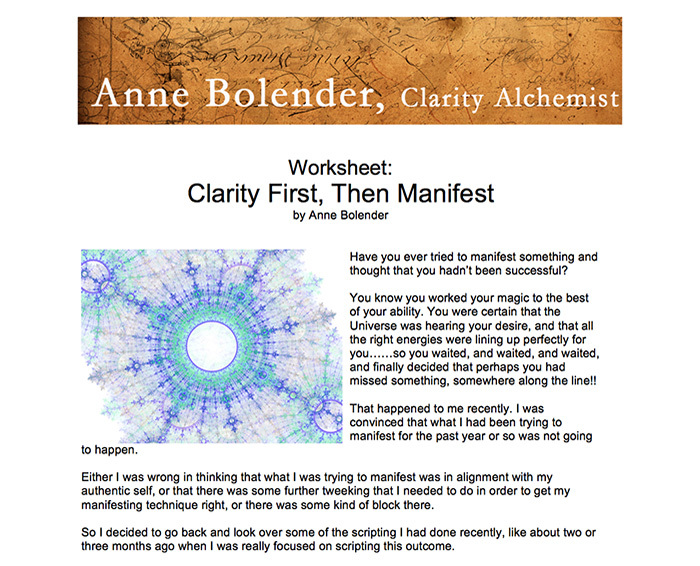 Clarity First, Then Manifest – regardless of whether you are trying to Consciously Create your desires, or you are setting a goal, unless you have clarity on what you are going after, achieving success can be challenging. 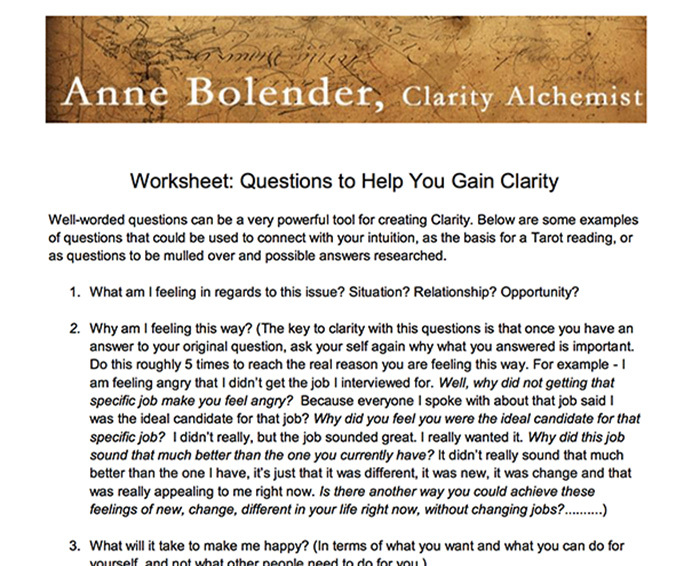 Questions to Help You Gain Clarity – answering the questions listed here on these sheets will provide you gain a deeper level of Clarity, so you can focus on the issue or challenge that you are dealing with. 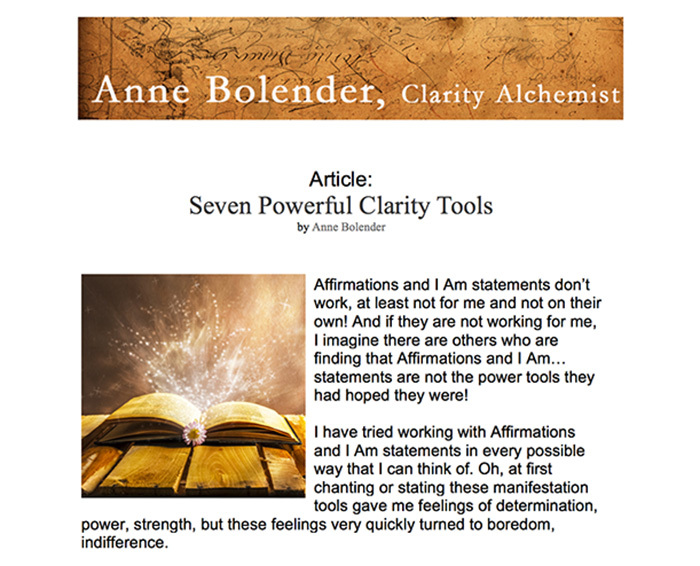 Seven Powerful Clarity Tools – these powerful Clarity tools can help you, not only drill deeper into Clarity, but help you find ways of bringing that Clarity into your everyday life. 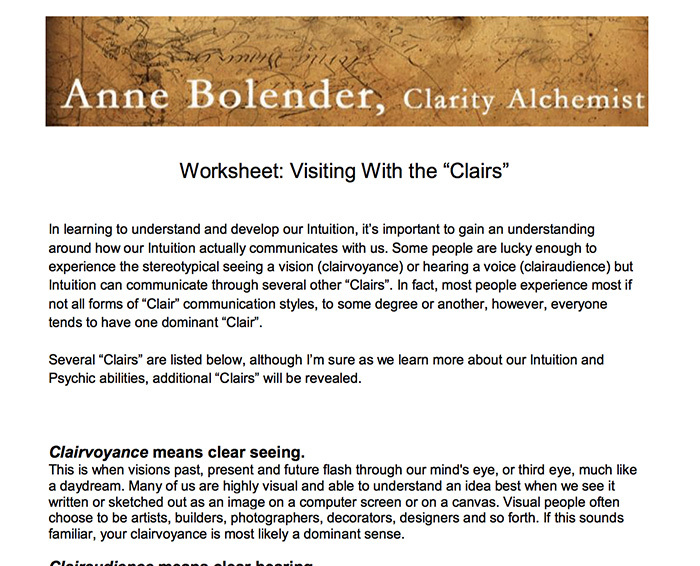 Visiting With the “Clairs” – There are several ways in which we can receive messages from our intuition: clairvoyance and clairsentience, to name two. This list of seven different “Clairs” can help you identify how you are receiving messages from your intuition. The 12 Laws of the Universe – The Law of Attraction is not the only Universal Law that governs our day-to-day life and our ability to manifest. 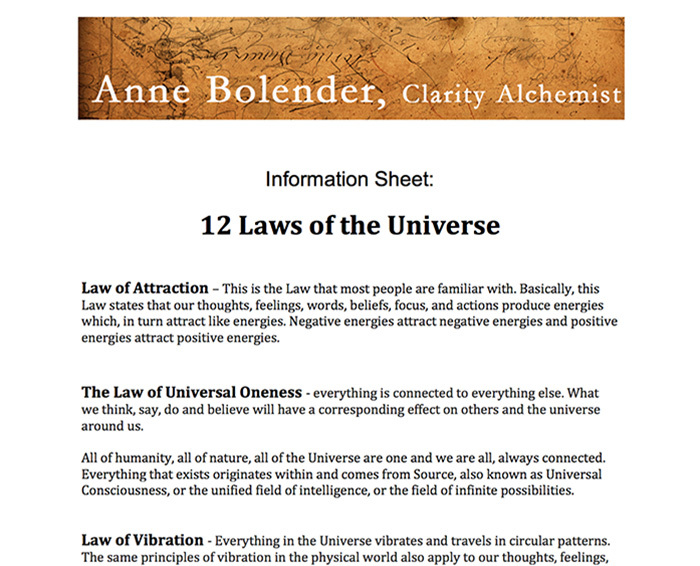 This list contains 11 additional Universal Laws, each one as powerful as the Law of Attraction. 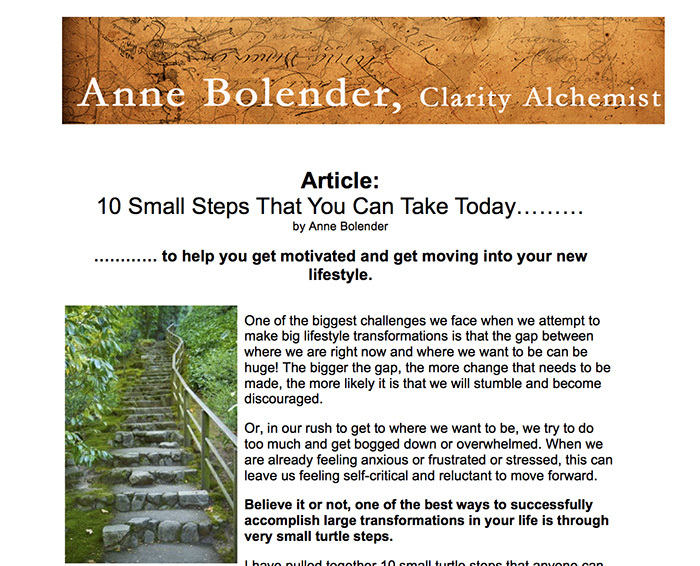 10 Small Steps – This article contains a list of 10 small steps that you can take starting today to help you get motivated and get moving into manifesting your new lifestyle. 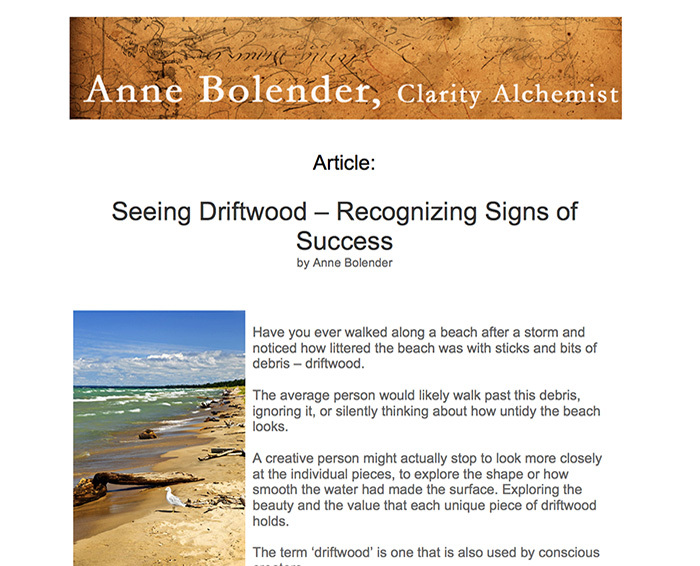 Seeing Driftwood – “Driftwood” is a term used by Conscious Creators when they are referring to seeing bits and pieces of the changes they are manifesting in their lives, before the whole transformation has been completed. Do You Believe In Magic? 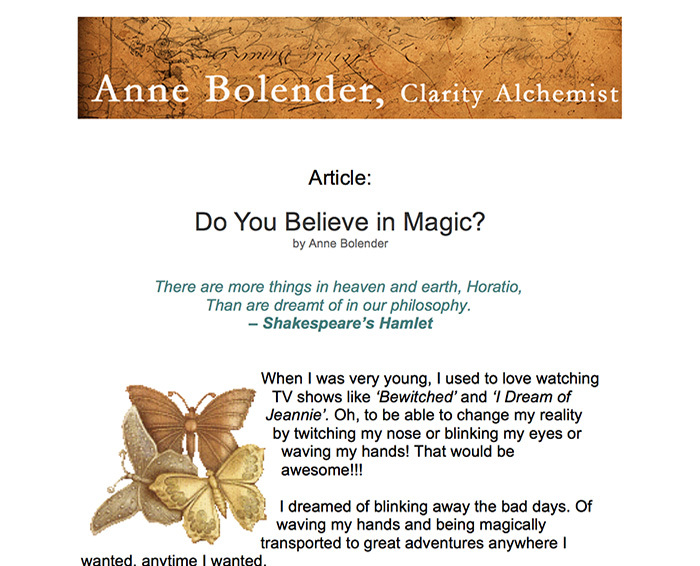 – Do you believe that you can produce mysterious and magnificent changes in your life? That you, your thoughts, your beliefs can change the world around you? 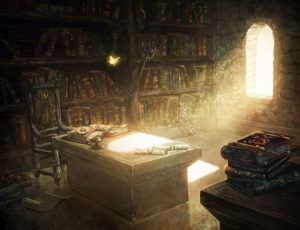 Creating Powerful Intentions – Conscious Creation, in fact, most forms of magic, begins by setting a powerful intention. 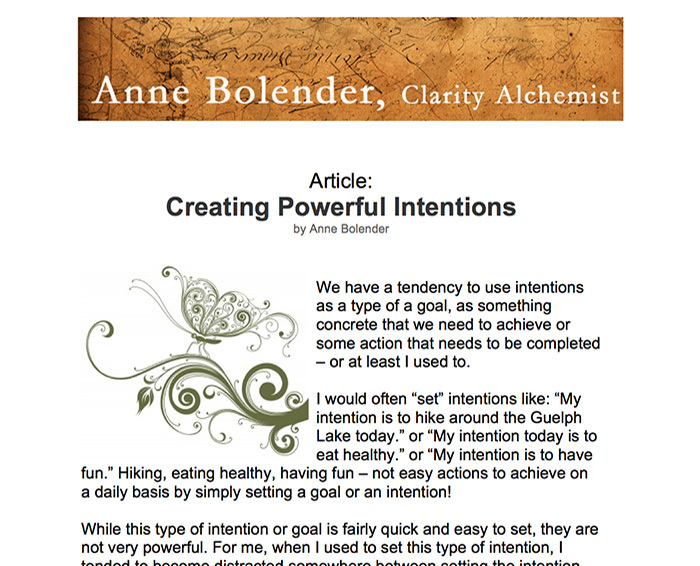 This article provides information on how to go about creating powerful intentions. 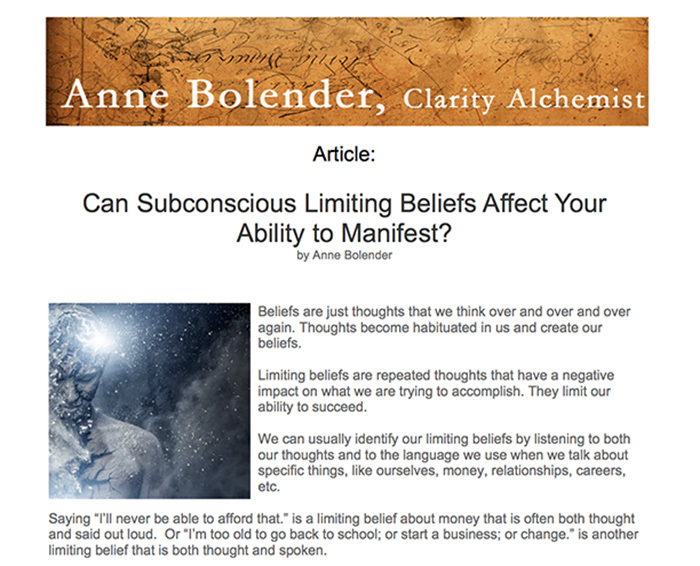 Can Subconscious Limiting Beliefs – This article looks at whether subconscious limiting beliefs, beliefs that you might not even be aware you have, can limit your ability to successfully manifest your desires. 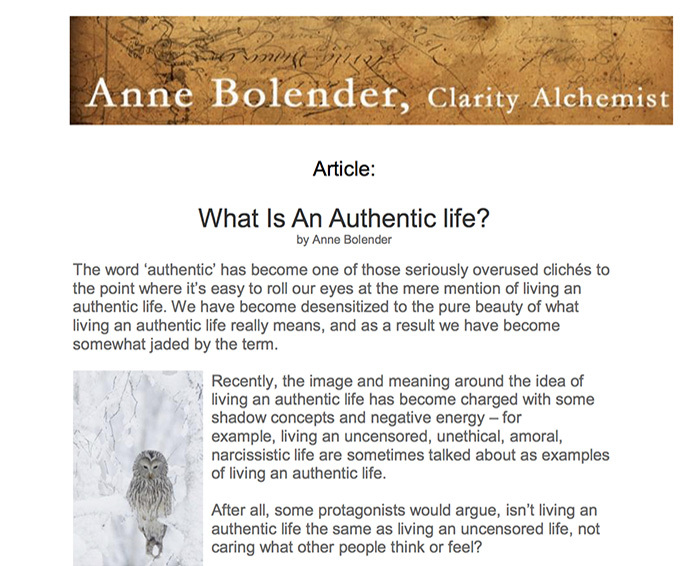 What is an Authentic Life? – The phrase ‘living an authentic life’ is one that is quickly becoming wildly overused by within the self-help industry. This article explores what ‘living an authentic life’ really means. 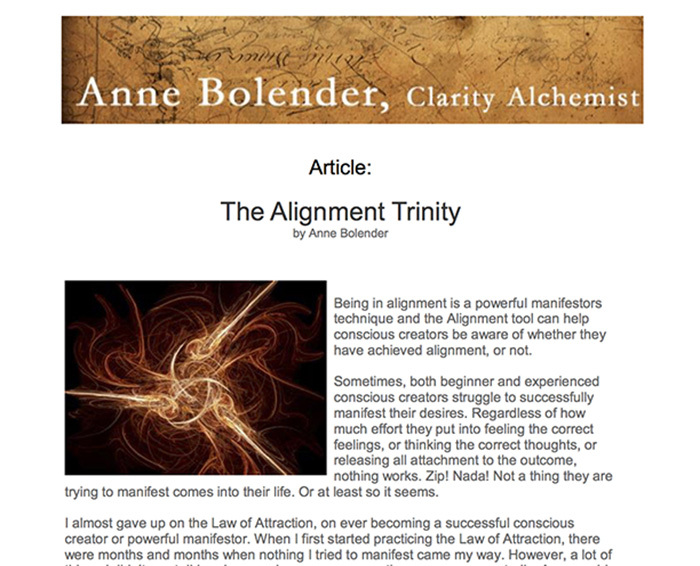 The Alignment Trinity – Powerful Conscious Creators know that successful, consistent manifesting requires that three things need to be in alignment in order for their manifesting to be successful. This article looks at what those three things are. 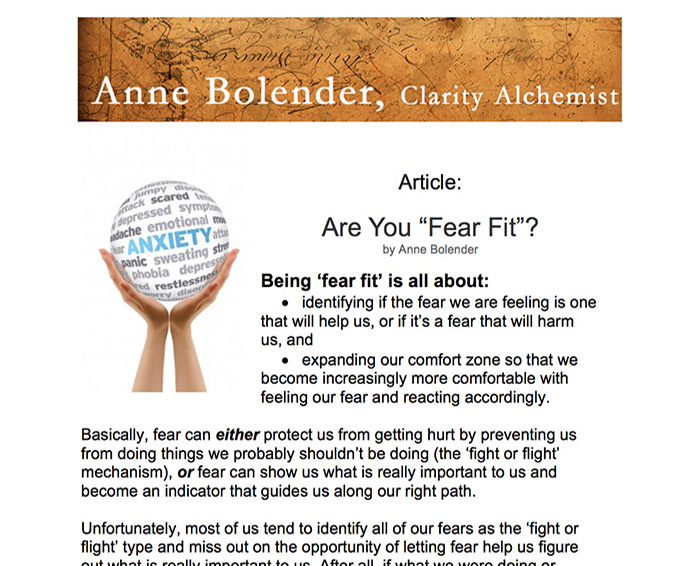 Are You ‘Fear Fit?” – There are two basic types of fears; good fears are fears that prevent you from being harmed, the not-so-good fears are fears that prevent you from stepping outside of your comfort zone and trying new things. Can you tell the two apart? 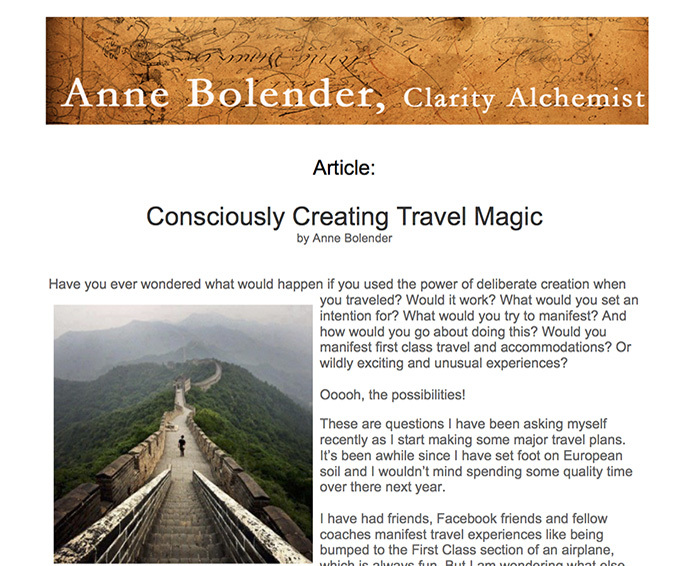 Consciously Creating Travel Magic – Manifesting unique travel experiences can be fun and relatively easy, once you put your mind to it.